PRAKOTHARN MR. DENCHAI, comes from Thailand, was diagnosed with colorectal cancer stage III after recurrence of bloody stool in 2013. On the advice of doctor, MR. DENCHAI underwent resection of colorectal tumor. In mid-2015, metastasis and recurrence occurred. The Ct scans turned out that there was a tumor in his liver and the size was about 3.5cm*3cm. After nanoknife in Modern Cancer Hospital Guangzhou, his condition is well under control and the tumor marker has almost backed to normal. The symptoms including fatigue have also disappeared. MR. DENCHAI is 43 years old this year (2016). Symptom of bloody stool occurred to him since 2008. Bloody stool is a typical symptom that occurs when colorectal cancer developed to a certain stage. However most people neglect the symptom as bleeding caused by internal piles and even doctors would make misdiagnosis. In fact, colorectal cancer, featuring high incidence rate and death rate, frequently occurs among people over 45. Therefore it is necessary to take promptly colorectal cancer screening as soon as the symptom of bloody stool occurs. After the occurrence of bloody stool, MR. DENCHAI didn’t take it serious. Until being diagnosed with sigmoid colorectal cancer in a regular check-up, he was in depressed mood and then undertook tumor removal on the doctor’s suggestion. One month after the surgery, MR. DENCHAI began to undergo chemotherapy which uses chemo drugs to kill cancer cells all over the body and may cause serious side effects. Indeed, MR. DENCHAI terribly suffered from severe hiccup after chemotherapy. “Every day I belched around the clock, which affected eating and sleeping.” Being unbearable to the side effects of chemotherapy, MR. DENCHAI gave up after two sessions of treatment. Finally, he got to know MCHG through a Thailand advertisement. Minimally invasive treatment taking advantages of few side effects caught his eyes and gave him hope. Therefore he went to Guangzhou for treatment. In MCHG, MR. DENCHAI confirmed the diagnosis, recurrence and metastasis of colorectal cancer stage IV after radical resection. For his hepatic metastatic tumor, Multi-Disciplinary Team (MDT) from MCHG immediately held a discussion. Since it was a single lesion, some doctors wondered whether surgery was feasible. The lesion was located between the right branch of portal vein and right hepatic artery. Applying removal surgery might cause damage to these tissues and also might have high risk. Ultimately after two-hour discussion, Multi-Disciplinary Team (MDT) decided to apply the most advanced technique nanoknife to Mr. DENCHAI. After the treatment, MR. DENCHAI’s tumor got promptly under control. In addition, he was free from side effects as before such as, nausea and vomiting. He got soon rid of weak condition and regained optimism and confidence. According to the chief physician Ma Xiaoying, currently MR. DENCHAI’s tumor marker has almost backed to normal and he is in good condition. 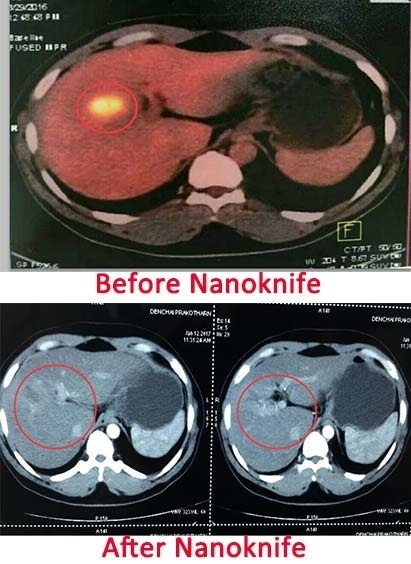 It is known that nanoknife has been approved by US FDA into clinical use Ministry of Public Health of China approved the technology for cancer treatment in 2015. It is a brand new ablation therapy for solid tumor occurred in liver and pancreas.